I like Almería. I like its mix of old and new. It is essentially a Spanish city with a North African flavour. It is one of the most ancient cities of Andalucía. Phoenicians, Carthaginians, Greeks and Romans have all left their mark, but it was the Moors that really put Almería on the map! The Romans called it ‘Portus Magnus’, but later it was called al-Mariyah, meaning ‘Mirror of the Sea’. During the time of Moorish rule, Almería rivalled Seville as a major Andalucian city. The Moors ruled from 955 until 1489 when the ‘Catholic Monarchs’ — Ferdinand and Isabella — captured the city. Approaching the city from the west provides a dramatic view of the town with the magnificent Alcazaba on the mountainside on the left and the port on the right. There are many things to see in Almería but the undoubted jewel in the crown is the Alcazaba. This enormous fortress dominates the city standing as it does on a hill overlooking the town and the sea. It was built in the tenth century but over the centuries it had further enhancements added such as a Moorish palace and, in the time of the Catholic Kings, a Christian palace. 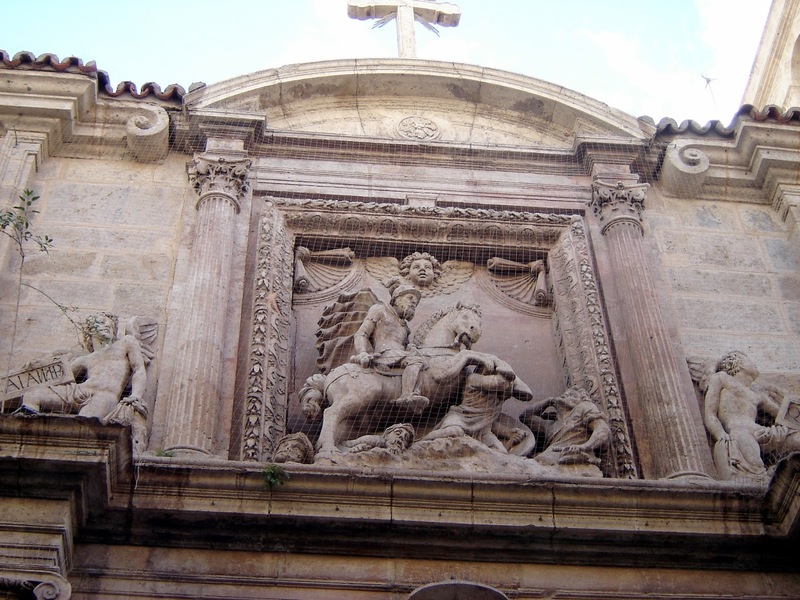 The Cathedral is the other principal monument in Almería. It was built in the sixteenth century and was designed as a place of prayer and of refuge. This was because the shores of Almería were continually under attack from Turks and Berbers and so it was used as a place of safety as well as worship. There are many historic buildings in Almería – the excellent map provided by the Tourist Office identifies thirty-three key places of interest but there are many more places of historic importance or of architectural merit. The city is a mixture of old and new and, I think, the buildings are a delight to look at with their Renaissance and Mudéjar façades. They are often exquisitely decorated in pastel colours, usually two-toned and have ornate window grilles. If you like looking at tasteful architecture you will like Almería. Avenida Federico García Lorca, a wide boulevard that has replaced the old Rambla de Belén, divides the modern city into east and west. West of the old rambla is the Paseo de Almería, one of the main thoroughfares with banks, shops and cafés. At the top of this road is Puerto de Purchena, the heart of the city. West of these landmarks is where the real historic part of the city is to be found. The Cathedral was built in Gothic style with a Renaissance façade. Whilst I can appreciate the workmanship inside, particularly the carved walnut stalls, I find the interior is rather austere. However, a door in the south wall leads to a sunny little oasis of peace and tranquillity in the form of a little garden brimming with flowers and shrubs. 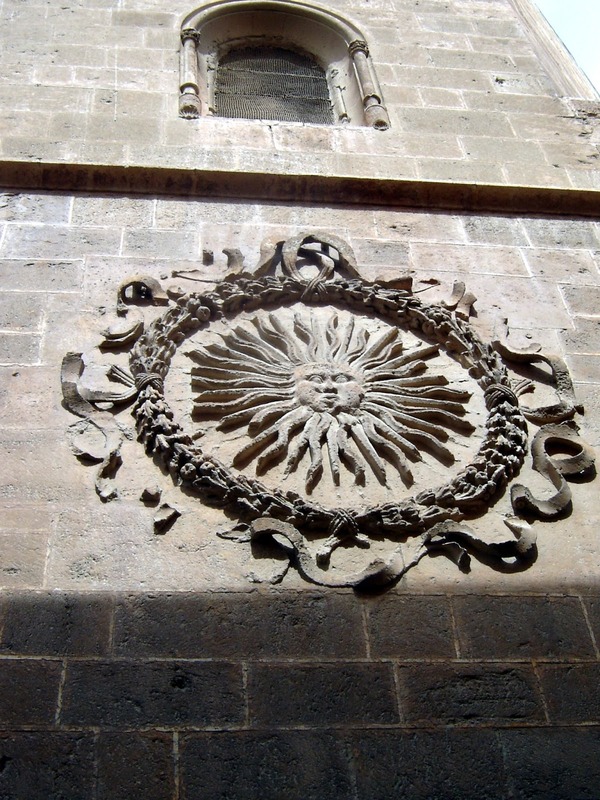 The east facing façade of the Cathedral has a relief of the Portocarro sun, the symbol of the city. 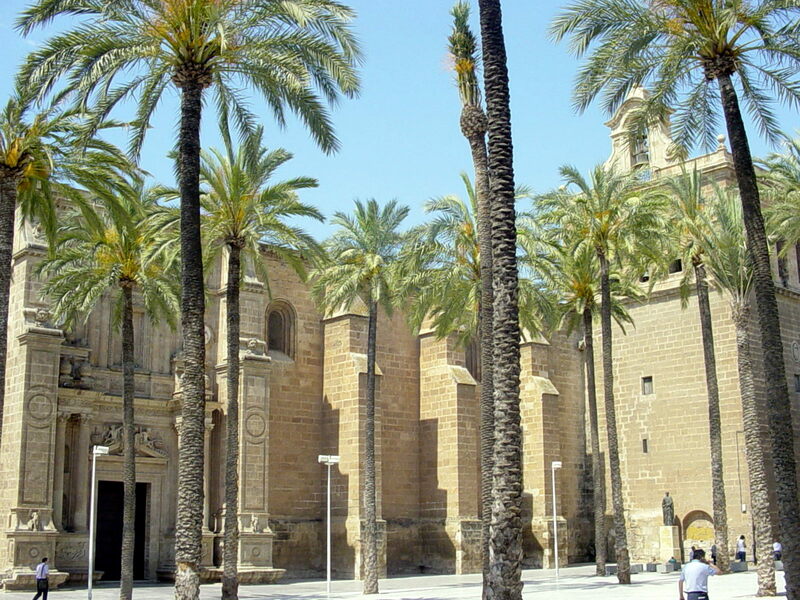 On the north side of the Cathedral is the Plaza de la Catedral, a large attractive square with many tall palm trees. Tourist leaflets describe the Cathedral as having stark formidable walls. Certainly, they are tall and solid and the buttresses, towers and bastions give the building the appearance of a fortress rather than a place of worship. Yet, I think the Cathedral is attractive, the sandstone coloured building set against the bright “Almerian Blue” sky with the palm trees in the foreground make for an agreeable scene. In any case, the cathedral doorways are impressive with rich Renaissance decorative features. Opposite the Cathedral is another attractive building, the ‘Palacio Episcopal’ or Bishop’s Palace. 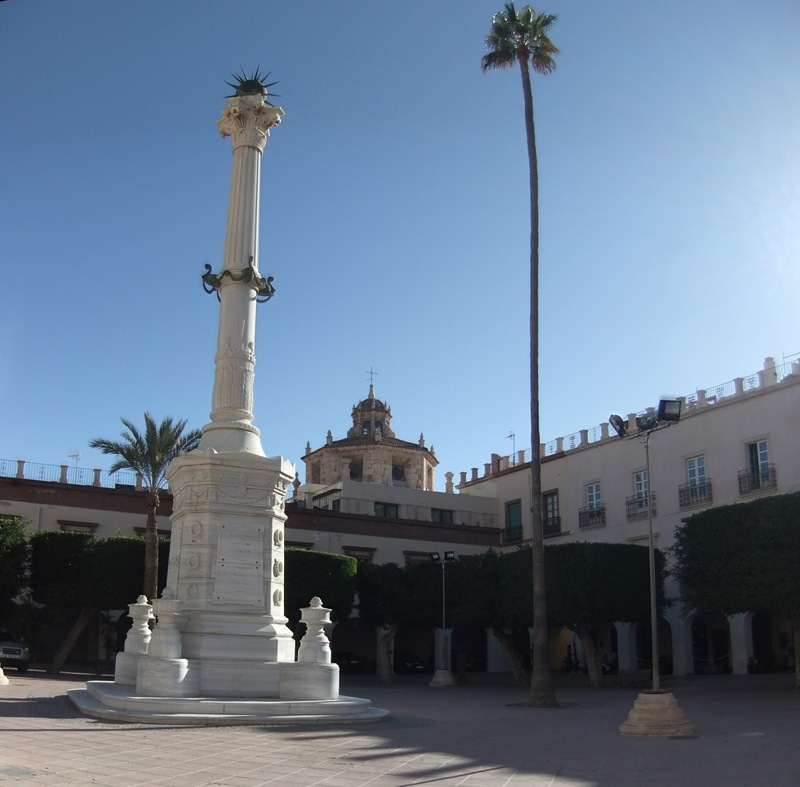 It was built in the nineteenth century when the upper classes started erecting the grand stately homes and palaces outside the old walled city of Muslim Almería. In the northwest corner of Plaza de la Catedral is the ‘Convento de las Puras’. It is now a church, and was built in the 17th century on the site of the former convent. A short distance the Cathedral is the ‘Plaza de la Constitución’ — also called the Plaza Vieja or Old Square. This 17th century arcaded square was really rather splendid a couple of years ago but, at the time of writing, it is being renovated. 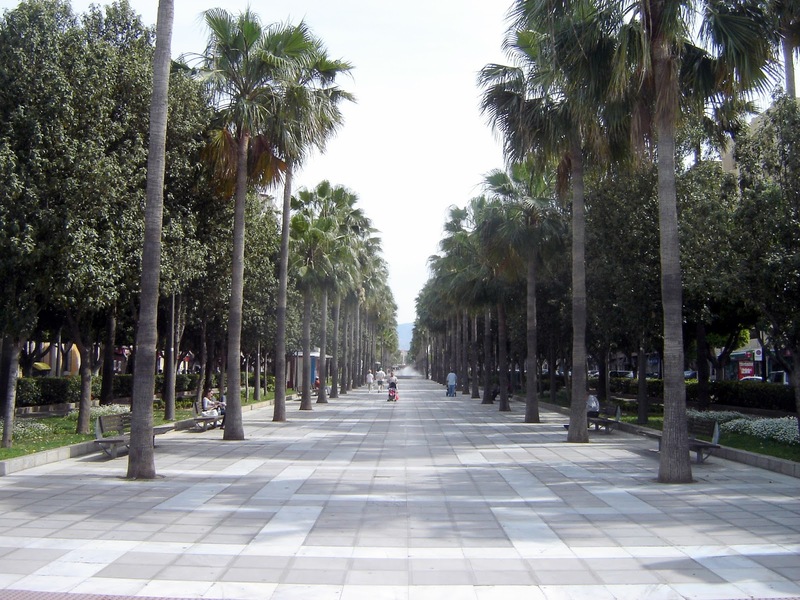 The plaza is entered via narrow alleyways and in the centre are palm trees and a commemorative monument in remembrance of a group of liberals who lost their lives in a revolt in 1824. 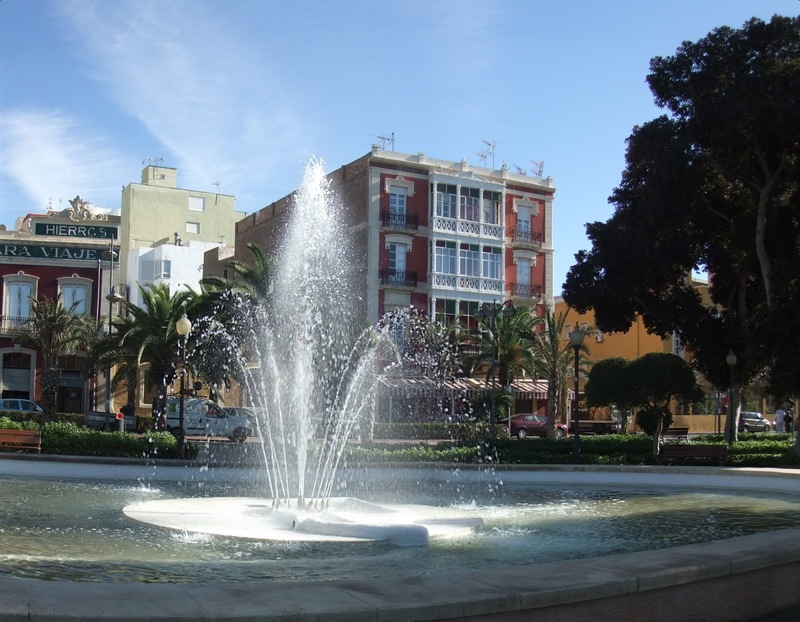 I hope this square returns to its former attractiveness because it is a little haven of peace in busy Almería. 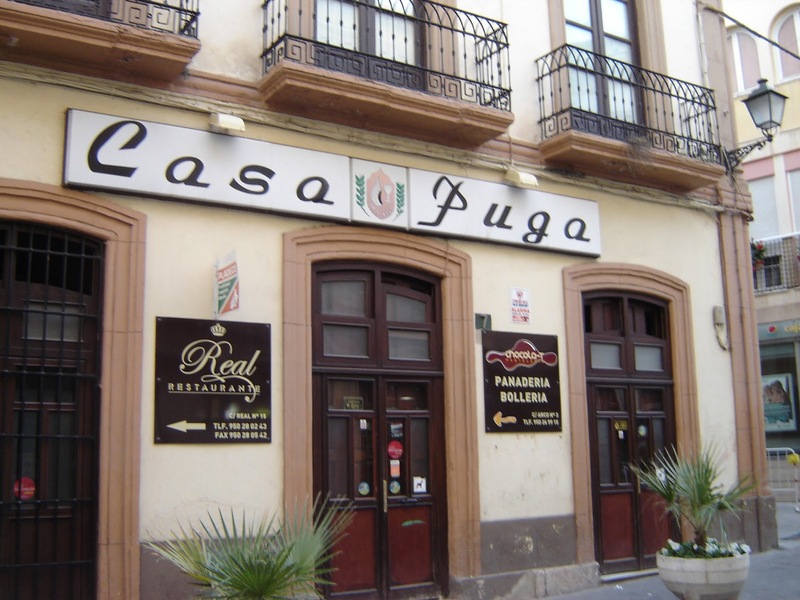 In this area of the city there is one of the best tapas bars in town – ‘Casa Puga’ is located in Calle Jovellanos. Just opposite is one of the oldest streets in the city, Calle de las Tiendas, which literally means ‘street of the shops’. This area has many little side streets with plenty of bars and shops. The Iglesia de Santiago is also located in this area and the main façade of this church is really rather splendid with its imposing Renaissance portal and magnificent sculptures including one depicting St. James, Slayer of the Moors. There are many fine churches in Almería and ‘Iglesia de San Pedro’, which stands in the square of the same name, is no exception. Named after St. Peter, it was one of three parish churches founded by the ‘Catholic Monarchs’, the others being San Juan (St. John) and the aforementioned Santiago (St. James). The church of ‘San Sebastian’ is appropriately sited in the Plaza San Sebastian with its delightful little statue, a simple monument to the Immaculate Conception. It was originally erected in 1800 and restored after the 1936 Spanish Civil War. From the 11th century onwards, this plaza was one of the most populous parts of the city. 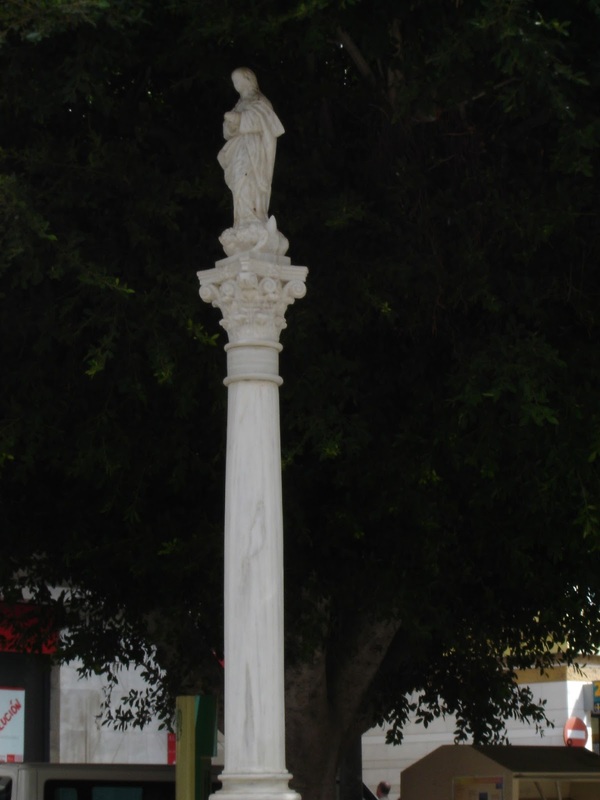 In Moorish times, a mosque stood there and later, in Christian Almería, it became a shrine to Saint Sebastian. In the 17th century, the church was built. Other religious buildings in the city include the convent of ‘Las Claras’ and the ‘Virgen del Mar’ church. 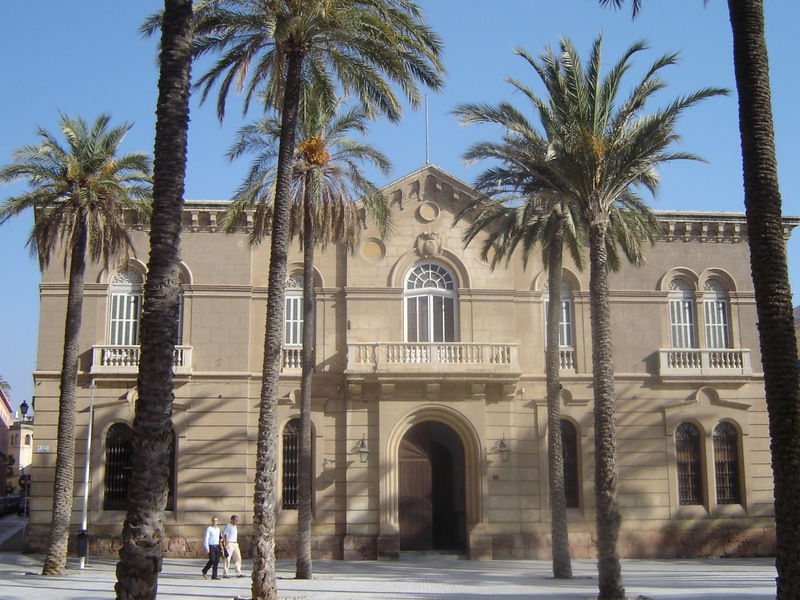 There are also a number of modernist buildings in Almería such as the ‘Palacio de los Marqueses de Cabra’. It is fine example of the aristocratic mansions built in Almería in the 19th century. Economic and demographic growth meant that the upper classes had much more money to spend so they started building grand stately homes outside the old Arab quarter. West of Calle Real is the old Arab quarter of the city. 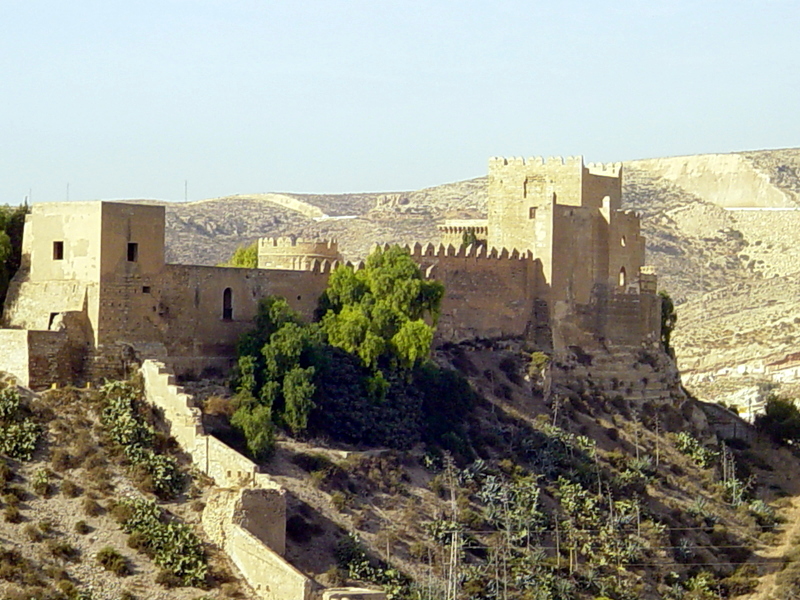 During the 11th century, Almería ceased to be part of the ‘Caliphate of Cordoba’ and became an independent kingdom. Many refugees from the Cordoban Civil War sought shelter in Almería but had to settle outside the old city walls. New defensive walls were built and the area between the older and the newly built walls was called the ‘Musalla Quarter’. In the maze of little streets of this area there are glimpses of the magnificent ‘Alcazaba’ high on its arid hill. 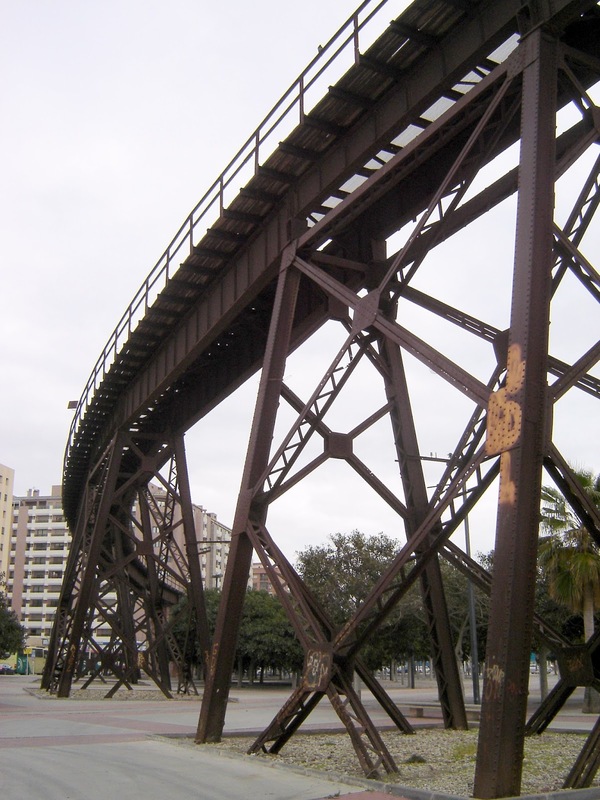 Other monuments in the city include the bullring, which was opened in 1888, and ‘El Cable Ingles’ which was used for loading ships with iron extracted from local mines in the early part of the 20th century. 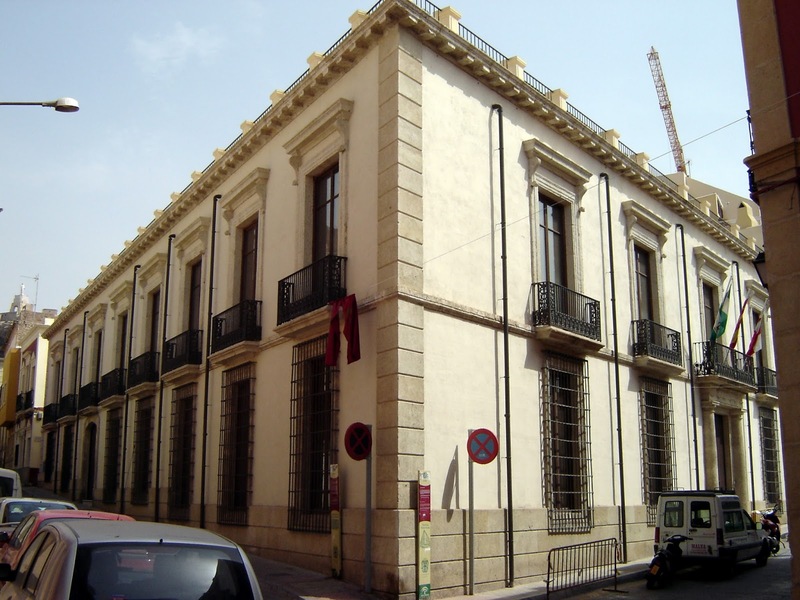 There are museums in Almería including the recently opened ‘Cinema Museum’ – the ‘Casa del Cine’ is located in Casa Santa Isabel, a 19th century mansion. John Lennon resided there when filming “How I Won the War”. If you don’t like architecture or museums, there are also beaches in Almería but you would probably be better off staying in Roquetas or Mojacar Playa! There are plazas, parks and gardens in the city including the ‘Parque de Nicolás Salmerón’. Robert Bovington is an English writer of travel books. These include “Spanish Matters” and “Spanish Impressions” Robert Bovington was born in Brighton, East Sussex, the son of Leonard and Audrey Bovington. He is the first-born and has eight siblings – six brothers and two sisters. Having worked for many years in both the telecommunications industry and the teaching profession, Robert wanted to take on new challenges. He and Diane decided to relocate to Spain and, in 2003, the couple moved to Roquetas de Mar in sunny Andalucía. However, lazing on the beach was not Robert's idea of fun - he wanted to explore his new homeland. It didn't stop there! He was so impressed with Spain, its countryside, its historic cities and its culture that it inspired him to write about his experiences. Robert Bovington has been married to Diane for over thirty years. They have no children. However, Robert’s short marriage to Helene resulted in twin daughters Carole and Sheila. The author is also a grandfather and great grandfather. Robert met Diane when both belonged to the Crescent Operatic Society. Music is one of the author’s great passions. At primary school he sang in a choir in a concert of Bach and Handel. Another of his interests is football and for many years he supported Brighton & Hove Albion home and away. His favourite premiership team is Arsenal. Other interests include information technology, writing and ten-pin bowling. This entry was posted in Spain, Spanish Impressions, travel and tagged Almería, Andalucía, Andalusia, Bovington, España, Spain. Bookmark the permalink.